← EQ7 – A must have! The first time I attended Quilt Festival in Houston in 2004, I fell in love with Susan Cleveland’s work. Her quilt, Spangled Star Banner, hung in the In the American Tradition III special exhibit. I loved how the perfect tiny piping, mini prairie points and bead embellishments gave this quilt perfect pizazz. Afterwards, I bought her tool to try my hand at the piping, but admittedly never got my act together to try it. Fast forward 6 years to spring 2010. Before I left for market, I designed several new quilts based on the Double Card Trick block I created for Driftwood. 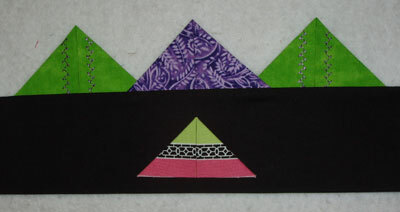 One of my favorites included a border with prairie points to mimic the paper-pieced triangles in the main blocks. Mind you, I’ve never made prairie points before! Anyway, as we were walking the aisles, suddenly we were in front of the “Pieces Be With You” booth with none other than Susan Cleveland, herself! She was demonstrating her Prairie Pointer tool! Do you believe in Kismet?? Of course I had to have one! This time, I wasted no time trying out my new tool! Here are my very first Prairie Points! Not bad for a beginner! I sewed the green and purple ones to the black fabric, but the pink/green one is just sitting on the black fabric. I tried using a stripe as Susan suggested – neat idea! 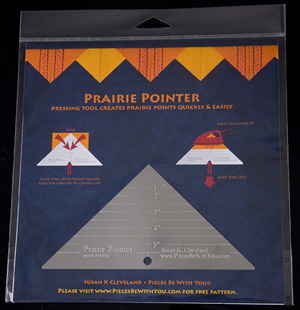 The tool really does make it easy and Susan has some great ideas about how to make the Prairie Points fun and special. Check out her website to see all her great products and ideas: www.piecesbewithyou.com Be sure to take a look at her beautiful award winning quilts! Susan’s booth as well as her quilts are just like a party! A great pillow project using the Prairie Points will be featured in the August issue of McCall’s Quilting, due out in June. The striped one is gorgeous!!! I may be getting this tool, too!